Stephen's Transformers Collection: Constructicons Unite! Long Haul desires to be a front line fighter instead of a transport specialist, but recognizes his important role in the Autobot-Decepticon conflict. As the second strongest Constructicon after Bonecrusher, his ability to carry large loads, coupled with the powerful dual heat seeking missile launcher he wields in his attack vehicle mode, make him a dangerous adversary. Scrapper is the leader of the formidable Constructicons. As such, Megatron values Scrapper's ability to organize his unit in order to assemble nearly any structure the Decepticons require. Scrapper's viciousness toward the Autobots make him quite popular among his Decepticon cronies. He forms the right leg of Devastator. Hook's intelligence and skill are the result of his elitist personality, and he simply cannot tolerate unprofessionalism and lack of perfection-qualities important fot this Decepticon equivalent of a doctor/surgeon. He forms the head and shoulders of Devastator. Mixmaster is very skilled at his function; to the extent that his superiors are often surprised by the products he can almost "magically" procure while creating materials for the superstructures that the talented Constructicons made infamous. Scavenger is a moving shovel on a rotating base. His robot mode looks odd, and he has the most purple colouring of all Constructicons. Bonecrusher is the strongest of the six Constructicons, and his battle prowess and ability to demolish fortifications makes him popular among his Decepticon comrades. His robot and vehicle mode are quite excellent, and in vehicle mode, his extra Devastator parts can be used to create an attack vehicle mode. Released in 1985, Devastator is the combination of the six constructicons; Team Leader Scrapper, Hook, Bonecrusher, Long Haul, Mixmaster and Scavenger. Devastator's forearms are also spring-loaded missile launchers, able to fire his fists as well as his drill attachments, though the springs were severely weakened in the US for safety reasons. He also comes armed with a large purple laser rifle. Hook and Scavenger's pistols can also be easily added to him for a little extra firepower. While the others' pistols can be added as well, they're not in very useful positions. 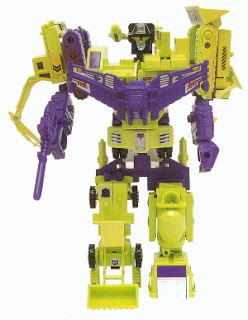 Unlike the later Scramble City-style combiners, Devastator's limbs cannot be rearranged into any other configurations. Although the Constructicons were produced in large quantities, and is one of the easiest combiners to find on the secondary market, they are always in demand and readily snatched up by casual and die-hard TFs fans alike as they were the most easily identifiable of all Transformers combiners.